Poor conditions hamper efforts to fight fire on ship headed for N.S. A firefighting tugboat arrived Friday evening to help extinguish a fire burning aboard a container ship that's about 1,500 kilometres southeast of Halifax, but weather conditions remain too poor for the crew to carry out its work. 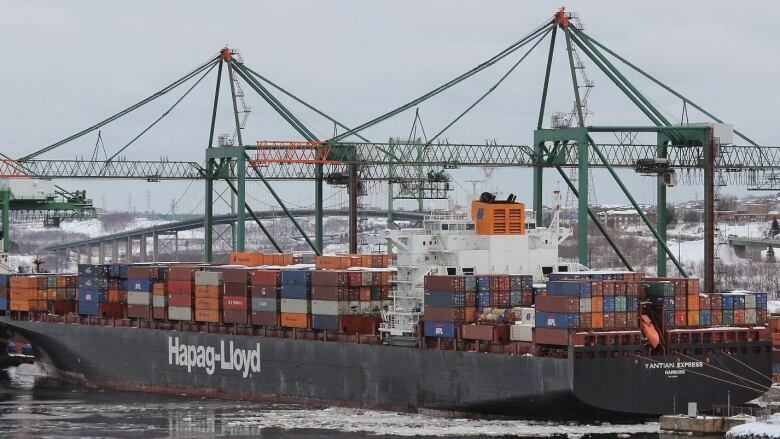 The international shipping company Hapag-Lloyd said the 320-metre Yantian Express was en route to Halifax on Thursday when a fire started inside a container on the ship's forward deck and then spread to several other containers. "The weather and sea conditions are still difficult and further extinguishing work requires an improvement of these conditions," said company spokesperson Tim Seifert in an email. None of the Yantian Express's eight officers and 15 seafarers are injured. The ship was on its way from Colombo, Sri Lanka, to Halifax via the Suez Canal. Seifert said it's not clear when the vessel will arrive in Halifax. A cargo ship from the Netherlands, the MV Happy Ranger, was offering assistance to the Yantian Express, but has since been relieved by the firefighting tugboat. Seifert said it's too soon to know how much damage the cargo or ship suffered.